So—what is a sugar plum? I knew the name from The Nutcracker and the Sugar Plum Fairy, but it turns out “sugar plum” originally referred to an expensive hard candy treat that had pretty much nothing to do with plums. The name, which is admittedly quite romantic, has given rise to some new desserts that fit the name, made from chopped dried fruits (like plums!) with nuts, spices, and sugar. I love that the name has inspired the creation of something that feels rather Victorian, but decidedly isn’t! Today we’re playing with the imagery of the sugar plum—purple and sparkles! Our fat blend is designed to be relatively slow tracing so we’ve got time to swirl—I did make it a bit faster tracing than some previous fat blends, though, as I knew I’d want a bit of viscosity without waiting absolutely ages. I achieved this by swapping 10% of the canola oil for 10% shea butter. For colour, I used a blend of two micas from YellowBee—a purple and a dark blue—to get the cool, rich purple I wanted. I found several of the deep purple micas I had on hand weren’t suitable for use in soap due to the inclusion of pH sensitive pigments like carmine or ferric ferrocyanide, so make sure you’re checking the INCI on your micas so they don’t pull an unwanted magic trick on you! 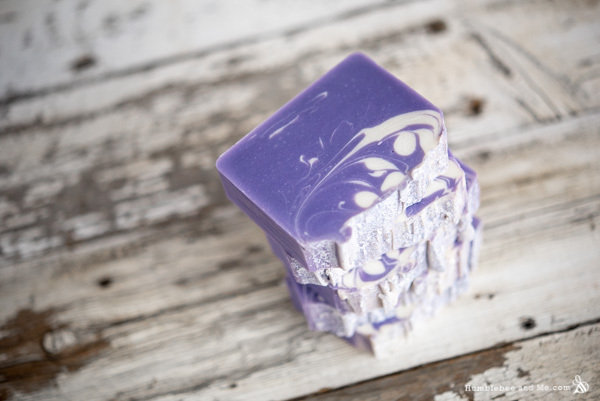 The scent for these bars is a bit out of sync with the rest of the series; I’m using “Sugared Spruce” fragrance oil here, but the rest of the series uses essential oils. Windy Point is selling it as part of their Christmas line-up this year, and it’s delightful. Wholesale Supplies Plus describes it as “a sweet and fresh blend of pine needles, orange, strawberry and a touch of sugared vanilla.” It’s clear and fresh and sweet and delightful. If you don’t want to use it, the essential oil blend for the rest of the series is a combination of benzoin (which smells like vanilla) and cardamom; you could use that blend here. I’ve been using approximately two parts benzoin to one part cardamom, so that would translate to 20g benzoin and 10g cardamom essential oil per 500g fats. The shallow white swirl makes me think of ballerinas in its graceful, wispy loveliness. Our topping features a dusting of mica (I mixed a touch of purple into a silver-white mica for a faintly lavender mica—feel free to use whatever you think will look lovely!) and a sprinkle of large grain sparkle sugar. 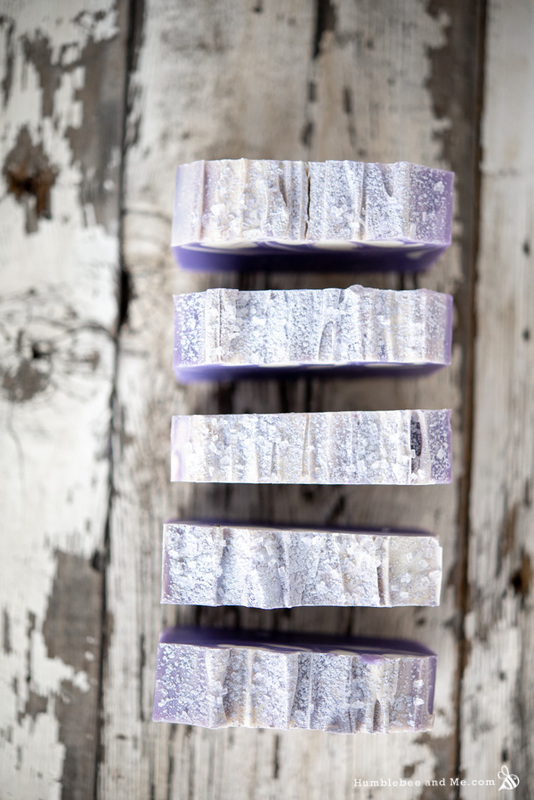 The finished bars are quite striking—crisp, cool purple contrasts with clean white. The top shimmers and sparkles, and the swirl adds some wintery whimsy. I love them, and I hope you do, too! 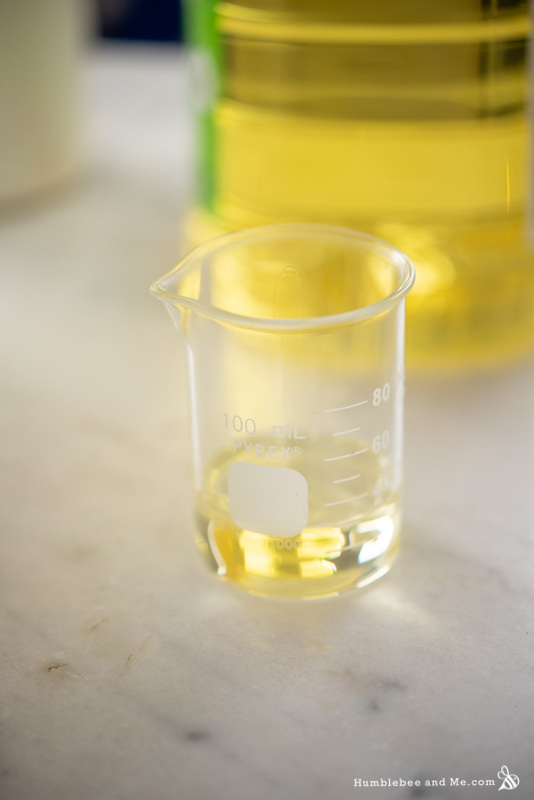 While everything is cooling, weigh out your fragrance oil, and whisk the micas and titanium dioxide together with a bit of extra canola oil. 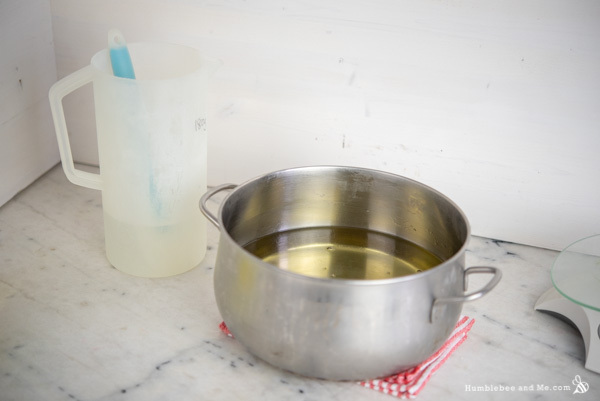 Once the melted fats and lye water are just slightly warmer than room temperature, follow standard soap making procedure to bring them to trace. When you have a relatively thin trace, blend in the fragrance oil. Now it’s time to divide up our batter! Pour about 15% of it into the small pitcher and leave the remaining batter in the pot. 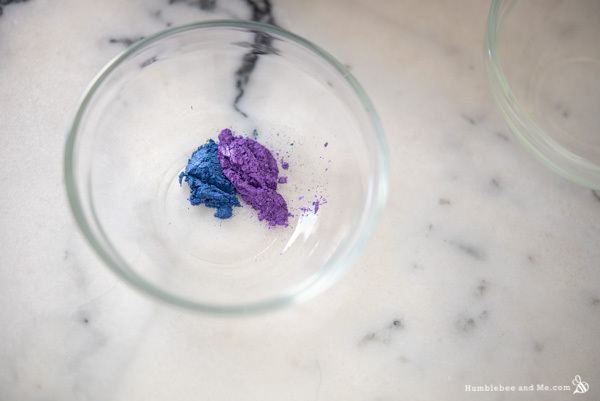 Add some titanium dioxide to the 15% and blend to combine—you just want enough to make it look a bit pastel/milky. If you’re using the same fragrance oil as I used, it makes the batter turn really yellow. 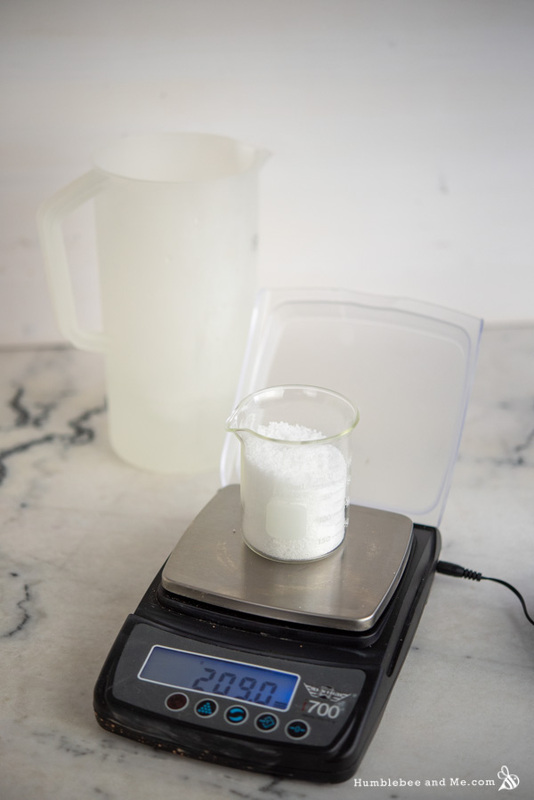 Don’t worry—that goes away during saponification, so don’t try to counter it with extra titanium dioxide. 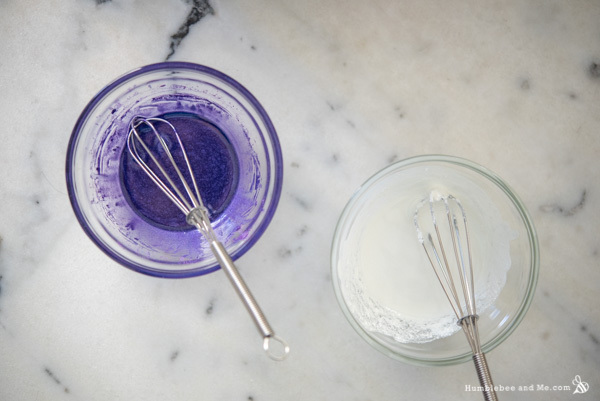 Use purple mica to colour the 85% of the batter purple, and then pour about half of it into the mould. Drizzle a bit of the titanium dioxide batter overtop, and then top that off with the rest of the purple batter. Drizzle the rest of the white batter overtop. Using a gear tie that’s been formed into a long, shallow “U”, create some shallow hanger swirls (watch the video to see what I did). Leave it to set up for about ten minutes before sculpting the top up a bit—I used a thin spatula to create low, lengthwise ridges. Dust the loaf with mica and sprinkle with sparkle sugar. Leave to saponify for 48. Remove from the mould and slice (slice it from the side so you don’t drag sugar through the soap), and then leave to age for at least four weeks before using or gifting. Enjoy! 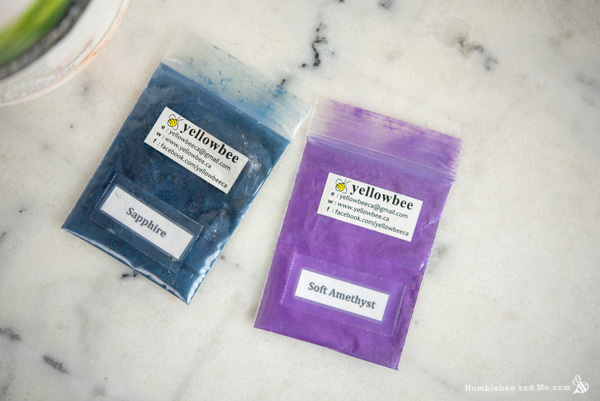 The Sapphire and Soft Amethyst micas were gifted by YellowBee. 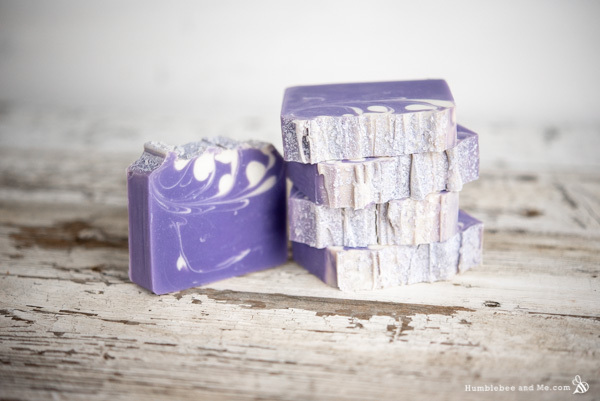 This soap looks gorgeous Marie, looking forward to your benzoin and cardamom recipes. I love that combination and will use it in this soap recipe. My sister is quite disappointed that I haven’t made any soap for a few months, but I haven’t been able to buy the distilled or deionized water (only fragrances for irons) even the local garage hasn’t got any 🙁 I am going to try a small batch with bottled spring water, fingers crossed. Thanks, Pauline! In years gone by I made many, many batches of soap with tap water and it was all fine (shhhhh, don’t tell haha). Obviously my tap water is not necessarily much like your tap water, but I suspect the bottled spring water will be fine 🙂 Happy soaping! 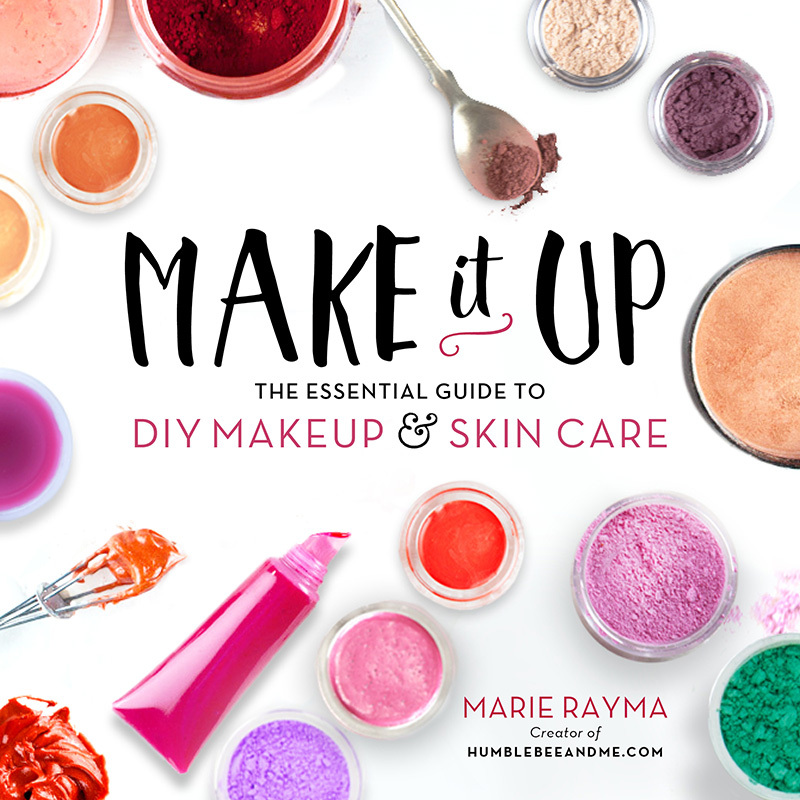 Thanks Marie, I am going to give it a go and hope for the best. I don’t know about our tap water lol sometimes I don’t even want to drink coffee made with it or cook with it.There have been times (Not too often, thankfully) it has smelt and tasted like TCP yuk!! :-( So I don’t know what that would do to soap batter. I tend to drink bottled water,and I will definitely try it in my next batch of soap. Would it be ok to use vanilla essential oil as well as benzoin as I don’t think I have quite enough benzoin? Or is vanilla essential oil not a good idea because it is water soluble? Thanks! 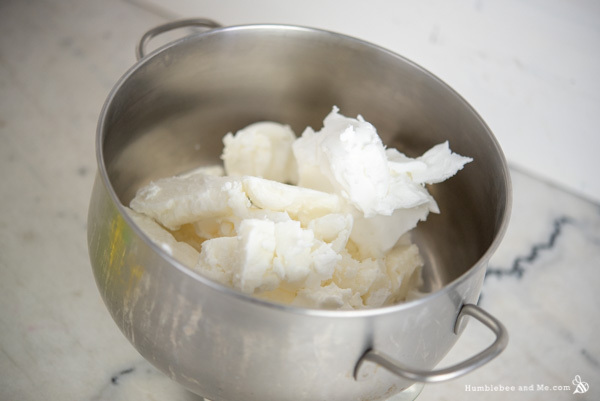 Hi Marie, if I do not have any more shea butter (used it all on another one of your soap recipes), do you think I could use canola oil at 45% instead of 35% + 10% shea butter? I noticed your Red Red Rose Soap uses olive oil at 45%, but I know its properties are different from canola. Lastly, thanks for being so thorough. I’m still a beginner, and I find your website extremely useful. Hey Amy! You can, but keep in mind the soap will trace more slowly and will require a bit more aging time 🙂 Happy soaping and thanks for DIYing with me!